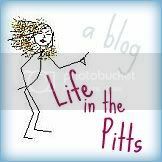 Life in the Pitts: "Well, that's unfortunate. I didn't even feel it." "Well, that's unfortunate. I didn't even feel it." We were chilling on the floor together. Kurt was lying on his back, flying Syndil in the air above him. I was looking on fondly. Then I noticed something. "Uh oh, looks like someone peed!" I reached over and felt the dark spot on Syndil's pants. Horrified, Kurt reached down to check. I stared at him in silence for a moment. ".....No. Syndil peed through her diaper." Relief washed over his face. "Oh. Good. I thought you meant me. I was like "Well, that's unfortunate. I didn't even feel it.""